Mod Pop – This one is in the wash right now, so hopefully tomorrow I can get a nice post-wash crinkly picture of it and do a full post! This is the last of my handmade Christmas gifts of the season, phew! Hexies – Slow but steady progress on this! I work on this once a week, during our game nights, and seem to be able to make one floret and the navy surround in an evening of gaming. So that means it should be done sometime in January. Although I’m planning to bring it along for Christmas since I will only be able to work on hand-stitched things. Picture paper-piece swap: I am doing a side swap with one of the gals that was in my 3×6 group. We both like picture paper-piece patterns, so we’re doing a swap! Now to pick which pattern to do..
Madrona Road challenge: I have the fabric and zero inspiration for what to do with it. 🙁 Is anyone else having the same problem? I am in love with the fabric but have nothing coming to me. Tote swap: Our guild is doing a tote swap, but it’s not due until March, so this probably won’t get worked on until January. April & Kerry’s quilt: I chatted with them and they’re fine with a smaller quilt. That makes the cutting seem a lot less daunting, so here’s hoping I will start making progress on this one! Low Volume improv: Back-burnered for a bit, I’ll probably pick this up again in January. Sew, Sew Modern: this swap is due at the end of January, so it’s time to pick this up again! I see a lot of paper piecing in my future! Linking up to the WIP Wednesday link party hosted by Lee at Freshly Pieced! 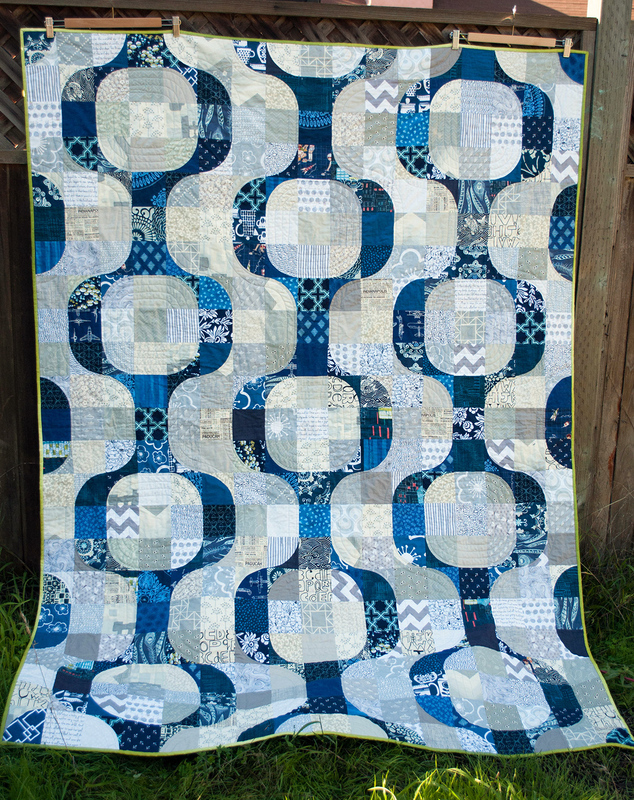 Love your Mod Pop quilt! It’s just gorgeous!! I love your mod pop quilt! Colour works so well. Love your quilt, it is so gorgeous and how the design pop up just for the use of colour even though you are using prints everywhere. Gorgeous. Ooh I hope you try it! The quilt pattern is available from Julie @ DistantPickles, and you can get the version that comes with plastic templates as well. And I was following along with a quilt-along that is still going, actually, and she’s planning to leave it active for a long time. So I hope you will share if you do end up doing this pattern!! Oh Mod Pop is SO beautiful!! Anxious to read your post – good job!! I’m working on the post tonight, so will probably be posted tomorrow. 😀 I got the last of the pictures and gave it to my friend today who loved it! Thanks so much! I love that Mod Pop. What are the challenge rules? Those hexies are looking good too. As I am seeing these Mod Pop quilts, I am thinking I am going to have to make one of my own…Nice Job! I hope you do try making one, they’re a lot of fun, and a lot easier than they look! The quilt pattern is available from Julie @ DistantPickles, and you can get the version that comes with plastic templates as well. I was following a quilt-along that is still going, and they’re planning to leave it active for a long time. So I hope you will share if you do end up doing this pattern!! is that a green binding on that gorgeous mod pop quilt!??!?! It looks amazing Anne! How did you end up quilting it? Why yes it IS green binding! 😀 I used the green ombre in the Simply Color line. I love it with the navy!! I tried about a bajillion different things and ended up going with just plain jane echo quilting. I have REALLY got to learn some quilting techniques! Beautiful! I love the contrasting colors! I love the ombre binding! I’ve been trying to decide what to do with the ombre print (if I ever bought any) and this is an excellent use. You can really appreciate the effect here. Nice job!